Love Peeps? Then you'll love this list of easy Easter Peeps desserts, made with everyone's favorite marshmallow chicks and bunnies! Eating Peeps plain is SO last century. Why settle for just eating your a regular Peep, when you can transform them into fun and creative Easter recipes? These recipes will give you an excuse to run to the store to stock up on Peeps, and if you find yourself with a surplus after Easter is over, put those leftovers to good use! How can you improve on marshmallow peeps? By adding chocolate, of course! 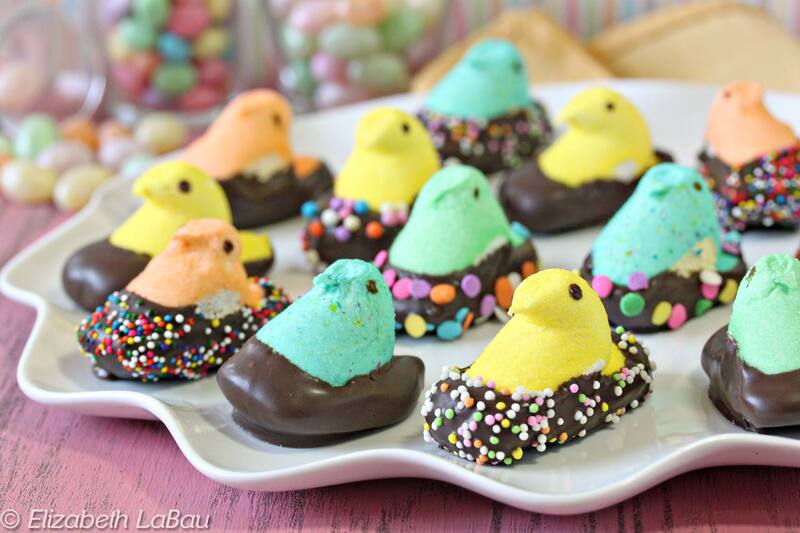 These chocolate-dipped peeps are adorable and so easy to make. Whip them up for a quick Easter treat or make them with little ones to give as gifts! Even if you think you don't like peeps, these peeps s'mores will make you a believer! The standard Peeps are utterly transformed in this simple recipe. They change from soft, springy marshmallows without much flavor, to crunchy candies with a caramelized sugar taste on the outside and a wonderfully gooey texture on the inside! When paired with graham crackers and dark chocolate, they're the most delicious Easter recipe you'll try this year. Who would have guessed such an easy dessert could taste so good?! This recipe has just three ingredients: two kinds of chocolate, and cute bunny Peeps. But when those 3 things are layered together in a skillet and baked, magic happens! Serve this ooey gooey dip with graham crackers and strawberries for maximum deliciousness. Give those bunny peeps a fancy makeover this year! By dipping your marshmallow bunnies in a few coatings of chocolate, you can give them quick and easy chocolate tuxedos, which makes them approximately 354% more adorable. You can also stick them on skewers to make tuxedo bunny peeps pops! These homemade marshmallow peeps retain the charming shape of the original, but these soft, fresh vanilla-scented marshmallows taste MUCH better. They're plush, light, fluffy, and perfect on their own or when toasted into s'mores!